James Spithill began his America's Cup career with Young Australia. In AC 32, he helmed Luna Rossa and earned a reputation as something of a demon in the pre-starts. 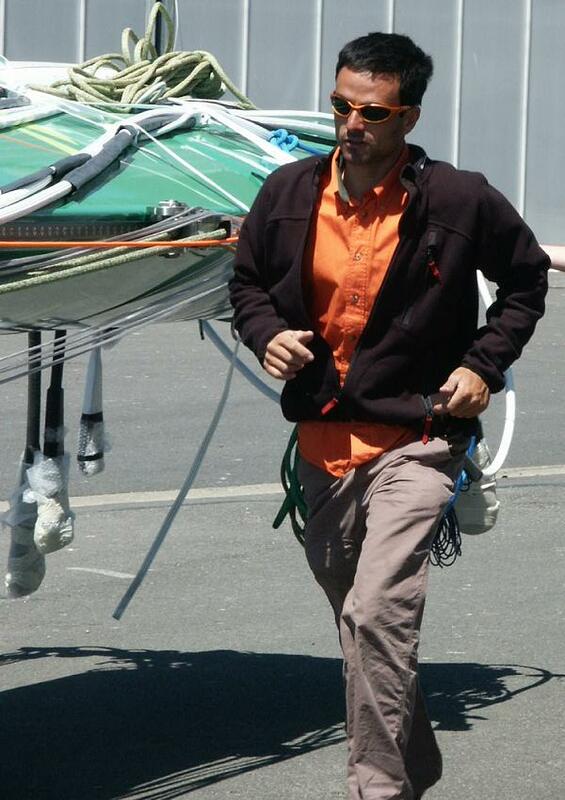 For AC 33, he is one of three potential helsmen for the BMW Oracle DoG multihull. Marian Martin caught up with Jimmy, after he'd been racing on USA-17 in Marseille, and began by asking him to explain what he expected to happen in a DoG match pre-start. You’ve said there won’t be any slam dunks, or lee bow tacks. Presumably, there won’t be any dial ups? 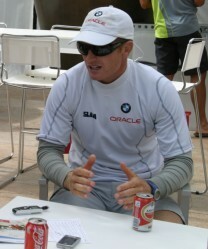 James Spithill. In the training work we’ve done there will be, but basically the boat that enters from the port end will be doing everything it can to avoid a dial up, just because it’s going to be so easy to be stopped and controlled. The sheer size of them must, surely, make it difficult anyway? JS. Yes, it will and it’s going to be difficult to cross someone once you’re on the same tack. You have to get so far forward, because the tack wasn’t so great, or the gybe wasn’t and that’s why you don’t want to get into a dial up. So what are we going to see, in terms of the differences in tactics? JS. Well, for one I think you aren’t going to see the bow on stern racing that we’re used to seeing in the monohulls. You won’t see that, but what you are going to see is boats going extremely fast and a lot of separation. Boats may be coming together, but they’ll want to accelerate away quickly, maybe coming back together, but I think people simply won’t be used to seeing the amount of separation that we’ll see with these things. Won’t that make it boring for the spectators? JS. Potentially it could mean two things. It could mean that it’ll be exciting just watching a boat sail, because it’s so fast. From a racing point of view, for the people that have really been into the racing and enjoyed the tactical side; yes, it won’t be the same as what they’re used to. You mentioned that they would be slow to gybe, as well as tack, but a lot of people seem to think these things are going to gybe very fast? JS. Obviously gybing will be better, but still the size of the sails you’ll have and the amount of time it will take to gybe one of these gennakers is going to take a significant amount of horsepower and a lot of winding on the pumps. So, you will drop a lot of boat speed. 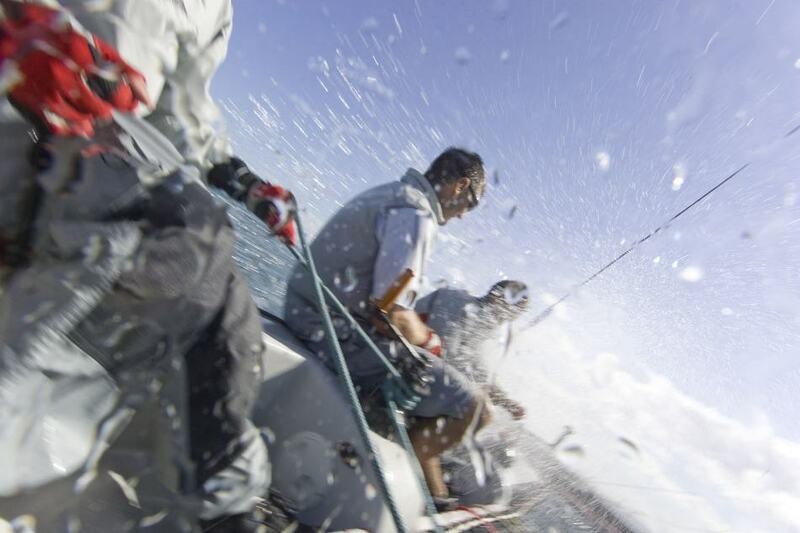 Going upwind, how long will it take to get from max speed on one tack to max on the other? JS. It’s hard to say until we get the boat, but if you take Groupama 2 it takes about 40 seconds. It’s just so difficult, especially if there are big waves and a trough; then it’s very, very difficult to tack. The sails are going to be huge, what are you going to do with the ones you aren’t using? JS. It’s a good point. I guess they’ll just have to sit on the trampoline, that’s what Groupama does; the sails they’re going to use in the race just sit on the trampoline. Some of them we might just leave furled up, just because they’ll be so big and heavy that, by the time you pull it down, you’ll feel you might as well have left it up. What size crew will you have? JS. We just don’t know. Until we get the boat and see what it’s like, what the sail plan’s like, what the power is, it’s hard to say. With multihulls you want to be as light as you can get, so we’ll be sailing with the minimum we require to still be able to get round the marks. When do you expect to start sea trials? JS. Later in the year, it all depends on the schedule. Until we get the boat it’s very difficult to say. It seems to me that, although you originally challenged for this July that seems to be definitely our and October sounds a bit iffy. I’m a follower of the big multis and as far as I remember they have all had to go back to the yard for some fairly substantial modifications that arose out of sea trials. So, are you going to be able to get it right first time? JS. Well, that is the question. I, certainly, can’t give you an answer, because I’ve no experience whatsoever with the build of a big multihull. That said, we’ve got some of the best guys and the most experienced with these big machines. Yes, but they aren’t more experienced than the people who built the likes of Orange II and their builds have had teething troubles. JS. Yes, I guess that is one of the challenges and it’s something the other guys are going to face as well. It’s part of the challenge of a new event. With the monohulls in the America’s Cup you’re 90% sure you’ll be alright. You do your sea trials and you’re pretty much 2 boat testing a few days later. Who knows, it could take longer to really put the boat through its paces. There’s the crew, as well as the boat. As far as I know, there’s only Cammas & Co with any big multi experience in BOR. How long is it going to take you to learn a whole new technique of racing? JS. Well we’ve been pushing really hard and, personally, I’ve been racing in the Formula 18 catamarans and I’ve got an A Class catamaran I’m racing and there’s the Extreme 40s and sailing on Groupama 2, the 60 foot tri. Yes, but these are still going to be different. JS. Yes and it’s very, very difficult to train on a very big multihull, you just can’t get one. Groupama 3 is being fixed and the big Banque Populaire isn’t finished; so, you’re right, it is difficult to train on those sized boats, but the fundamentals, the concepts of smaller boats usually go through to the big ones. There seems to be two sorts of small boats; the Xtreme 40s which seem to often sail with a hull very high out of the water and the Decision type designed to only lift a hull slightly at maximum speed. Do you expect to be high in the air on the giant, because everyone is talking about the danger? JS. Well, to be honest listening to the experts and we’ve had some great guys come in to coach us I reckon we’ll mostly have the windward hull just out of the water. I reckon the only time we might fly a hull high is downwind, just so you can sail deeper. If the boats are close I don’t think you’ll see a high flying hull, because of the safety factor. We’ll be pushing, but if you make a mistake in one of these it’s all over, it’s end of campaign. If you make a mistake in a monohull, you might break a sail, but the boat’s OK. That’s something too that you learn from when you’re sailing on the little boats. Why don�t we see people wearing helmets on racing multis? JS. We�ve talked about that a bit, because obviously if you nose dive ��. We�ve talked about helmets and a bit of a line, so you�re attached to something at the back in case you get thrown forward. I reckon the guys wear something, but it could be a mask, on Groupama 3. It might just be for spray though. Yes, the guys who�ve done the laps say they wear something like a Surf Gath helmet, but the main reason they�re wearing it is for the spray. Do you think there will have to be rules especially written for these races? For example, the give way boat has to have sufficient room to keep clear, but who is going to decide what is sufficient room when there’s never been a race between two such boats? JS. Yes, that’s going to be tough, because it’s not like the umpires – if you have on water umpires – it’s not like they can really train for it and be ready. To a certain extent, we’ve developed our own in house rules, for when we’re doing this Xtreme 40 match racing and I’m sure Alinghi have done the same thing on their side. So, I think they’ll probably be able to take the knowledge they’ve gained and try to pass it on to the officials. Is this something you’ll be co-operating on? Coming back to the safety angle; if this thing were to go over how would you account for everyone and get them out. JS. Yes, this is something you don’t like to think about, but you need to think about. I think, in general, we’re just going to be backing off a bit, a lot quicker than we do on monohulls. I think we’ll have to, because these boats are going to be incredibly big and incredibly powerful and we’re just not going to be pushing them as hard as we push monohulls; that’s the down side. Then, for instance, on a monohull not everyone carries a knife, but everyone on board this will carry a knife, everyone will probably have some sort of attachment line, things like that, so that if everything goes bad you’ve got something. Obviously, the safety factor is a big concern. BOR has Franck Cammas, Russell Coutts and yourself, who all could be described as ambitious helmsmen. Is there a sort of needle match over this? JS. To be honest, we’re all pretty relaxed; we’ve all said from day one that we just want the best person for the job to do it. We all want to be part of a winning team and, like I said, from day one we didn’t want any in-house fighting; that’s the philosophy I’ve had from Luna Rossa, where we were a very open team and Russell’s the same and says the best person should be on the job. Right now, Franck is the most experienced guy. Most experienced in terms of driving, but not in racing. JS. That’s right and we’re just going to have to take all that into consideration depending on what the racing’s going to be like and once we’ve got the boat. How do you think you will decide? JS. No idea! ……. To be honest, I think it will be obvious; I really do. I think by the time we get to the racing, whenever it is, it’s going to be obvious which people should be in each position. I honestly do, because at the end of the day it’s three races, maybe, could be two and we just want the result. There seems to be two schools of thought among enthusiasts. 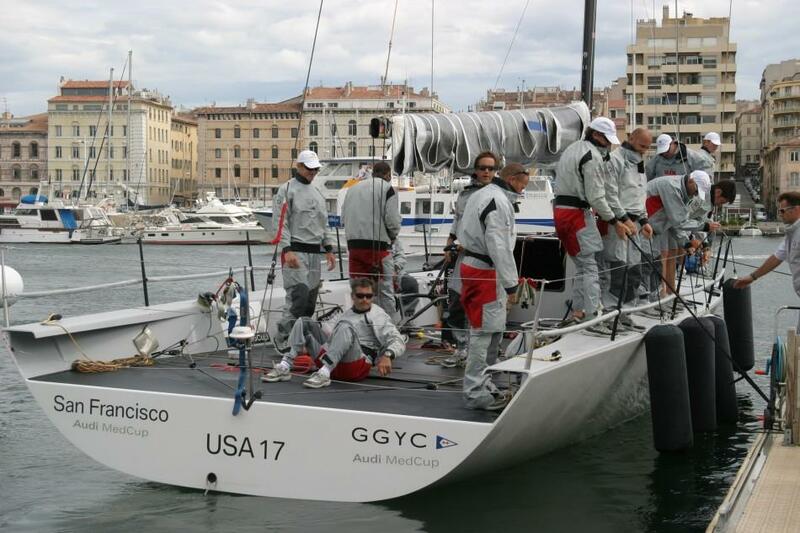 There are those who say �The America�s Cup should be elitist and this is right. Two billionaires fighting it out is how it should be.� and the other school says �I like the multi-challenge and it�s good that low budget teams like Germany and Shosholoza get a chance to come in.� You started on Young Australia, a low budget team, do you think they should be in the America�s Cup? JS. I think so. Yes, for sure, Young Australia was very low budget and myself and a lot of guys that were involved in that project wouldn’t be where we are without that opportunity. I think it’s still there though. This is a rare thing that, funnily enough, seems to happen a lot in the cycles of the America’s Cup, but what we want is to go back to the conventional Cup that allows everyone to get to challenge, everyone gets to enter the event and off you go. It’s the only way to get young guys and new sailors into it. Right now, two teams; it’s pretty tough for anyone else to be involved. Do you think it’s going to be in Valencia? JS. I don’t know; it’s so hard to know what’s going to happen on that side. It would certainly be easier, as we’ve got the teams, the bases, the infrastructure there.